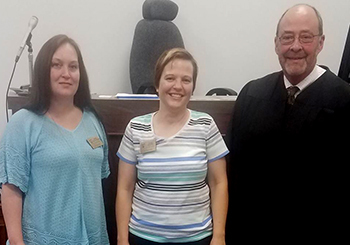 Recently, Judge Lawrence Gendler swore in Jay Davis, Lisa Garcia, and Ron Pagitt as CASA volunteers. All three have already begun advocating for children! Jay, Lisa and Ron are already getting to know the children so they will be able to make recommendations to the Judge in the children's best interest. They are becoming a stable, reliable presence in the children’s life during a very difficult time. More volunteers are needed! A new training class will start in April. To Learn More, please call (402) 296-9521 or Contact Us. 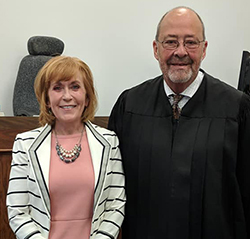 Peggy Kowalczyk was sworn in as a CASA advocate by Judge John Steinheider on August 31, 2018. As an advocate, she will get to know the child she advocates for and make recommendations to the Judge about what would be best for the child. She will become a stable, reliable presence in the child’s life during a very difficult time. 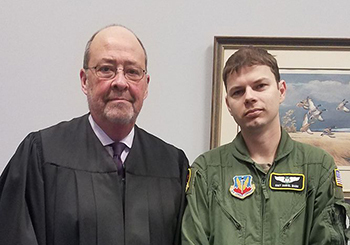 Cass County Court Appointed Special Advocate (CASA) program received a huge round of support from the Cass County community on April 14, 2018. CASA hosted their 60’s theme – Peace, Love and Murder Mystery Dinner at Nebraska Brewing Company, La Vista, NE. The fundraiser committee was chaired by Nikki Biesterfeld and Lisa Davis. It was the organization's major fundraising event of the year. 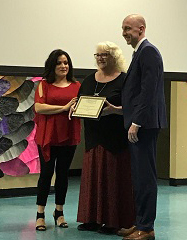 Approximately 160 people attended the Murder Mystery Dinner which generated more than $8300 profit from community sponsorships, ticket sales and donations to the organization. Big Canvas' actors entertained the guests with clues, murder & humor. Jill Rollins solved the Murder Mystery and Brenda Promes of Springfield won the Heads and Tails Bead game. Special “Thanks” to the events Outta Sight Level: Scott and Heidi Cline - Team Tenacious with Keller Williams; Far Out Level - Casey Hunter, FM Lift Pro; Groovy Level - Hope’s Closet. Special thanks to the Silent auction donators: Absolute Healthcare, LLC, Bay Hills Golf Club, Bomgaars, Brown Floral, Godfather’s Pizza, Hy-Vee, La Fiesta, Little Caesar’s, Main Street Jewelers, Plattsmouth Animal Clinic, Scooters, Sister’s Café, Subway, The Hop Yard all from Plattsmouth and First State Bank-Weeping Water. Desserts by Herban Coffee Lab -Plattsmouth, Stan’s Bakery and Nadine Kreifels for cookies and decorations. A big shout out to Adam and Megan Hollingsworth for creating our CASA video and serving as our sound technicians. Many thanks to the community, and the many individuals who donated their time and resources to make this a successful event. Between May 2017 through April 2018, 16 CASA advocates and two staff members have advocated for 44 children. 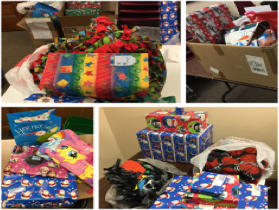 Four children have been adopted and 21 children have been reunified with their parent(s). 31 children’s case were opened. During this timeframe, 16 advocates have logged in more than 8,395 miles and 1,800 hours. 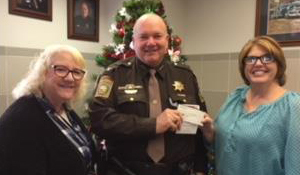 Through the efforts of its advocates, Cass County CASA has saved the county approximately $49,197. Many Important Events Happen Every Month! The most critical events don't appear on Cass County CASA's Calendar of Events. That is because our volunteers work behind the scenes to improve a child's future. Each and every time one of our volunteers meet with the child they advocate for or other important adults in that child's life, a profound event takes place.